The restaurant Rocca im Gehry’s has been recommended to me various times and finally it was time to give it a try. Once you are seated, you get not only bread and spread but also vegetables sticks which is quite a nice surprise. 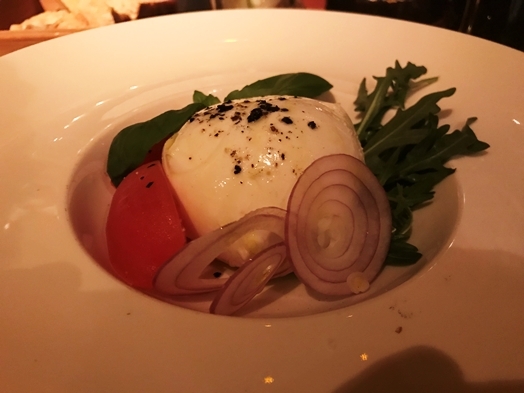 As a starter, I went for the “mozzarella di buffala with pealed roma tomatoes, rocket salad, and basil” (EUR 14.00). The tomatoes were a bit out of season admittedly and lacked taste but the mozzarella was delicious. Overall a solid starter but probably better in summer when the tomatoes are ripe. 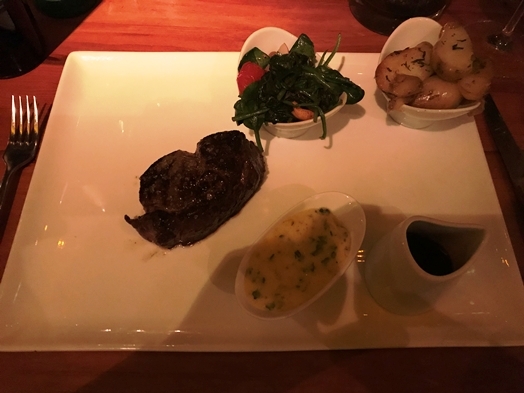 Given the Rocca is famous for its steaks (kind of not so surprising given it is a steakhouse), I went for the “Uruguay Premium Black Angus Beef, 200gr Filet, served with rosemary potatoes, a red wine shallot sauce” (EUR 27.00) and I took “fresh leaf spinach with cashews” (EUR 6.00) and “Sauce Béarnaise” (EUR 2.00) as side dishes. The meat was quite good and the grill flavours were nice without being completely overwhelming. Frankly, the spinach was a bit overpriced but tasty. Overall, the Rocca im Gehry’s is worth visiting as they have good dishes, a nice atmosphere and friendly service. With regards to prices it is also decent but the side dishes are overpriced for my personal gusto. On a Monday it was not that busy but I suppose during the rest of the week, booking a table is recommendable.